Yesterday the weather cooperated, and an outside day was had. I got the sawmill started and finished off the 16′ log that had been on the bed for months now. I got some nice 2x4s out of it. Next I took some wide boards off my “seasoned” pile and stacked them edgewise on the bed, and sawed them into 2x4s too. Since these boards were dry, I was able to use them for the firewood partition I was rebuilding in the garage. On my afternoon break, I looked at the local paper online, and noticed the Calumet Players were doing “Arsenic and Old Lace” at the Calumet Theater. This was to be their last performance, so I asked Alice if she was interested in going. We hemmed and hawed, and eventually decided to get cleaned up and go. We had a very nice meal at the Irish Times in Laurium, and then headed to the theater. We knew many of the cast members, and saw several friends in the audience. A good time was had by all. 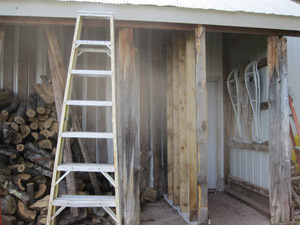 This morning, I went back to work on the firewood partition in the garage. I needed some help to make sure the mark I made on the upper plate was plumb with the mark on the lower one. There is almost no good reason for making these studs plumb other than I am a fussy codger. Alice kindly came our and helped guide my finger on the string on the upper plate, and the plumb bob on the marks on the lower plate. Between the two of us, the upper plate got marked accurately. Next I needed help measuring the distance for the 4 studs. After I had the data, I went to work on the miter saw and using a large number of air, cordless, and power tools, the wall was back in place. I do not worry about firewood causing a collapse of this wall any time soon. Next I walked over to the Avion camper I’ve been puttering with for several years now. 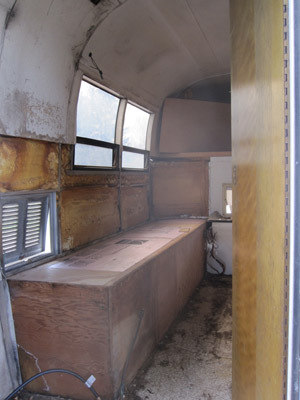 I’ve rebuilt part of the rotted away left wing of the camper, and it’s been sitting in my shop for a while. Today I got it out to the camper again and fitted it into place. I had to do some adjusting and hammering, but I finally got the thing the way I wanted it. So I drilled and screwed in one of the faces of the wing. There is more work to do on it yet, but this was an important step. Once I complete this project, I’ll be able to jack the camper up on its legs and go to work on the floor that is also rotted out. Then I can start replacing the various components of th camper that are broken and/or obsolete. The Avion is an aluminum camper that is over 40 years old. I feel like I’m building our own personal rocket ship. This entry was posted on Sunday, May 8th, 2011 at 9:58 pm and is filed under Uncategorized. You can follow any responses to this entry through the RSS 2.0 feed. You can leave a response, or trackback from your own site.